As a brother, I ask you to remain in peace. I ask you from my heart, let's go forward' At the end of a highly unusual spiritual retreat for the political leaders of warring factions, Pope Francis knelt at the feet of the leaders of South Sudan, begging them to give peace a chance and to be worthy “fathers of the nation.” “As a brother, I ask you to remain in peace. I ask you from my heart, let’s go forward. There will be many problems, but do not be afraid,” he told the leaders, speaking without a text at the end of the meeting. “You have begun a process, may it end well,” he said. “There will be disagreements among you, but may they take place ‘in the office’ while, in front of your people, you hold hands; in this way, you will be transformed from simple citizens to fathers of the nation.” “The purpose of this retreat is for us to stand together before God and to discern his will,” he said in his formal remarks on April 11, closing the two-day retreat in the Domus Sanctae Marthae, the Vatican guesthouse where he lives. The retreat participants included South Sudanese President Salva Kiir and four of the nation’s five designated vice presidents: Riek Machar, James Wani Igga, Taban Deng Gai and Rebecca Nyandeng De Mabior. Under the terms of a peace agreement signed in September, the vice presidents were to take office together May 12, sharing power and ending the armed conflict between clans and among communities. The retreat was the idea of Anglican Archbishop Justin Welby of Canterbury, spiritual leader of the Anglican Communion, who attended the final part of the gathering. 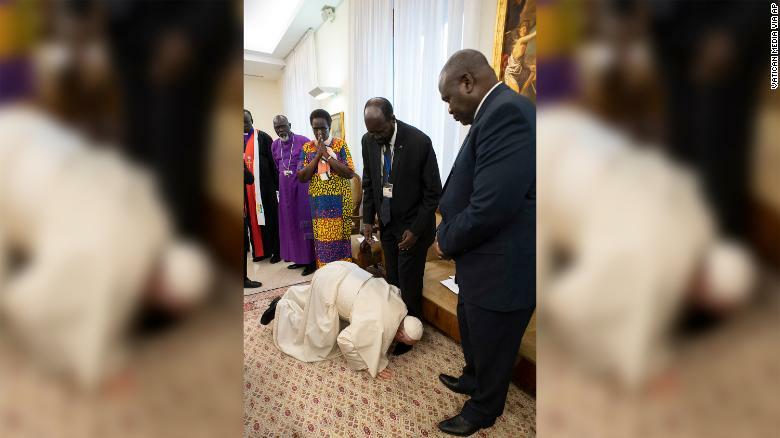 He and Pope Francis have been supporting the peace efforts of the South Sudan Council of Churches and, the Pope said again on April 11, they hope to visit South Sudan together when there is peace. Pope Francis expressed his hope that “hostilities will finally cease — please, may they cease — that the armistice will be respected, and that political and ethnic divisions will be surmounted.” Closing his prepared remarks with a prayer, he asked God “to touch with the power of the Spirit the depths of every human heart, so that enemies will be open to dialogue, adversaries will join hands and peoples will meet in harmony.” “By your gift, Father, may the whole-hearted search for peace resolve disputes, may love conquer hatred and may revenge be disarmed by forgiveness, so that, relying solely on your mercy, we may find our way back to you,” he prayed.